Found room 4 smoke Detector activated . Managers notified to get smoke detector fixed. Received a call for an activated alarm at the Homestead. Arrived on scene and investigated. 1600A on location recalled all units with the exception on Station 160. Determined that it was a false alarm. We reset the system and cleared the scene at 10:03am. Shut gas meter off and used gas sniffer to test gas dryer and furnace no leak found,notified home owner to call the gas company. They had aprox 60 min eta. All units cleared scene at 10:00am. 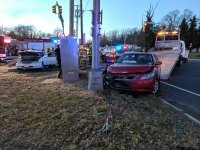 Two Car motor vehicle crash with entrapment. Used jaws to remove two victims and assisted EMS & police. Upon arrival found smoke detector in alarm,removed detector cleaned and reset alarm. Received a call for an activated fire alarm. Arrived on scene and determined that it was a false alarm. The owner self cleared the alarm prior to arrival. Inspected the system and placed it back online and cleared the scene.